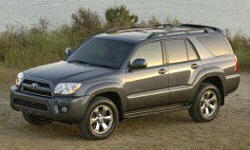 Toyota 4Runner Fuel Economy Pros and Cons | Page 1 of 1 | Why Not This Car? What drives people to buy (or not buy) a certain car? 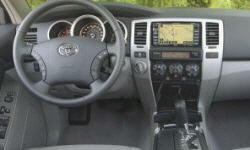 TrueDelta's members share Toyota 4Runner pros and cons based on their real-world driving experiences. Trying to improve MPG above 17 may not happen. The previous owner Beat this poor old 4Runner, only put in a new trans, which is now slipping ever-so-slightly (not low fluid). If fuel cost is a concern, then this is definitely not the vehicle to have. Manages 18mpg combined if driven carefully. Does what it does extremely well so nothing unexpected. The dash readout is optimistic. I often though I was getting over 25mpg only to calculate as low as 14--on the highway! Ultimately, this was the 4Runners undoing. I traded it for a much more efficient Camry. Not really bad, but how about a hybrid? A Prius 4runner? Lousy mileage around town. ~ 18. Poor economy, other competitors achieve better fuel economy and performance. Mid size and large SUVs are not good on fuel economy. While shopping this market fuel economy was a consideration. Fuel economy is projected at 17 mpg in the city and 22-23 mpg on the highway. This is one of the leaders for vehicles in this class. Trip gauge is incorrect. when it says 22mpg you are really getting 20 mpg, but not bad for a big V8 just annoying that the gauge is off by about 2 mpg. Not that I dislike the 4runners fuel economy, actually for a large sport utility it does pretty good, just done buy a suv if your looking to get good gas mileage. Best mileage for a vehicle that can tow 5,000 pounds. 21mpg in the summer for my typical daily driving. It uses quite a bit of gas, I average 16 l/ 100km, or roughly about 15 mpg, and I do fair bit of highway driving. I knew going in that it would use a lot, but it still makes me grimace. Still, when we had a foot of new snow and I was driving around stalled and tire-spinning vehicles with absolutely no difficulty (on Michelin all-seasons), you figure that it balances. Higher than average for this size and type of vehicle. less than 20 MPG in the city.